It is a DC 0-10A Digital Ammeter,Operating voltage: DC 8 ~ 12V,Operating current:.. It is a DC 0-30A Digital Ammeter,Operating voltage: DC 8 ~ 12V,Operating current:.. It is a Digital Tester/Red Led Display Ammeter, Measure Current Range: DC 0 ~ 200mA, Operating volta.. This is a small size, high accuracy, with a shell designed ammeter. Measuring DC 0.0A to 100A. Can (.. It is a DC 0A-10A Red LED Digital Ammeter,4V-30V Powered,Refresh rate: about 200ms time,Application:..
Ii is a Red/Blue/Green LED Digital Ammeter ,Power Supply DC 4-30V,Measuring Range DC 0-9.99A, Three .. It is a 2in1 Volt Amp Panel Meter, Measure Voltage Range DC 0-199.9V,Measure Current Range 0-100A (r.. 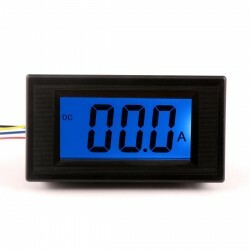 It is DC digital ampere meter, three digit 0.56" LED tube display, can measure DC 0-20.0A current, w.. It is a DC 0-200A LCD Digital Ammeter,DC 8 ~ 12V Powered,Measuring rang: DC 0~200A,Operating current.. It is a DC 0-2A Digital Ammeter,Operating voltage: DC 8 ~ 12V,Operating current:.. It is a Red LED Ampere Meter With Current Shunt Resistor,Measurement Range:DC 0-300A,Power Supply:D.. It is a Green LED Ampere Meter With Current Shunt Resistor,Measurement Range:DC 0-300A,Power Supply:.. It is a 2in1 Volt Amp Panel Meter, Measure Voltage Range DC 0-300V,Measure Current Range 0-200A forw.. It is an analog meter can measure 0-30mA, it can work in -20 ~ 50 ℃, damping response time of less t..